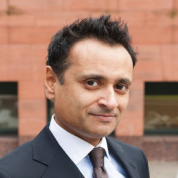 Arup Ganguly is a Managing Partner at KNG Securities LLP (KNG). Established in 2003, City of London based KNG is today one of the most active independent secondary market brokers of corporate and convertible bonds. KNG also advises on primary financing solutions for mid cap corporate issuers and repackaging of existing debt. Prior to establishing KNG, Arup spent 11 years in the employment of Goldman Sachs where he was a director within their convertible bond sales and trading business. Aside from KNG, Arup is also the founding chairman of the global community volunteering initiative, Sewa Day. Established just five years ago, Sewa Day 2014 attracted over 100,000 volunteers from over 25 countries. Arup resides in North London with his wife and three sons.